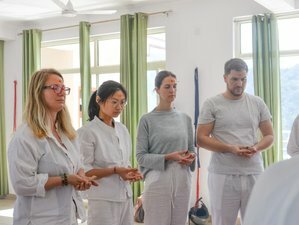 Join Adi Yogpeeth for 200 hours of therapeutic holistic yoga teacher training program in Rishikesh, India which is perfectly suited for those who wants to learn yoga with a therapeutic approach. By signing up for this specific yoga course, a student can improve his or her understanding of the ways in which yoga can improve the mind, body, and soul. Also, practicing yoga in Rishikesh can be an extremely holistic experience for any person, making it easier for the practitioner to work on his or her spiritual as well as carer ascension. Also, the class size is very small in order to impart proper knowledge, feedback session, and group discussion. In the room, clean bed sheets, blankets, and pillows will be provided. Every room has air-conditioner and attached bathroom with cold and hot water 24 hours. This complete school campus has unlimited high bandwidth Wi-Fi service. The school is surrounded by the serene green mountains which heal the inner soul and river Ganga flow at a walking distance. Students who complete their subsequent trainings are eligible to register with Yoga Alliance as Registered Yoga Teachers (RYT®). Therefore, learned yoga teachers from Adi Yogpeeth can teacher all around the world as a certified yoga teacher. Adi Yogpeeth offers 200 hours of therapeutic holistic yoga teacher training program in Rishikesh. This intensive yoga course covers the basics and advanced level of yoga therapy based asanas, pranayama, meditation yoga anatomy, yoga therapy and Ayurveda, teaching methodology, naturopathy, yoga philosophy, and yogic nutrition. It is suitable for yoga practitioners of all levels, as well as medical and fitness. Students learn to develop sequences suited to an individual’s needs and limitations, and experience first-hand what it is like to teach a yoga therapy class directed at treating different ailments of body and mind. This course is best suitable for yoga practitioners, yoga therapist, physiotherapist, sports therapist, physical education teachers, and fitness instructors of all levels and practitioners who are looking for a solid foundation in yoga therapy and its applications. The word 'Haṭha' literally means 'force' and thus alludes to a system of physical techniques. In India, Hatha yoga is associated in popular tradition. Prana means 'breath' or 'life force'. Students get introduced to the practice of pranayama or controlling one’s breath, an important prerequisite to gaining control of one’s mind. Students will learn Indian traditional Ayurveda and therapeutic use of yoga and its benefit on body and mind. The proper understanding of the physical body will help to prevent injury before, during, and after practice. There are two kinds of yoga anatomy: physical and spiritual. Understanding both types is needed. Meditation is a systematic practice that promotes physical, mental, and emotional tranquility with the purpose of reaching Samadhi (self-realization). When a yoga practitioner moves through the various internal states of Yoga Nidra, a profound experience of relaxation occurs. This is called 'Turiya', a sensation of pure bliss. Yoga philosophy is the foundation of your yoga practice and is the key to earn yogic strength. Through the path of Vedanta philosophy, you will establish a solid, well-rounded yoga practice. A yoga teacher should efficiently perform the practical applications of class planning and preparation. At Adi Yogpeeth, their students will learn how to create a positive and peaceful class environment for an enjoyable and transformative experience. Yogi Sanjay Ji is sharing his knowledge at Adi Yogpeeth, Rishikesh as a pranayama and meditation teacher, which help the teacher training students to develop their breathing skills. Yogi Sanjay Ji is full of energy and knowledge, which helps him to motivate students so that they can focus deeply on yoga in their regular life, and can improve their inner strength and determination. Mahesh was born and raised in a very spiritual family. He graduated from Garhwal University with a science background. He transformed after meeting his guru who helped him realize and understand energy and how he is connected intimately to society and others through his own energy. His guru taught him to cultivate this energy through his personal practices. Kushal, a native of Rishikesh, completed his entire yoga education here. He is a Master Degree holder in yogic science. His extensive service in the vast field of yoga includes a unique feat of teaching yoga to soldiers in the Indian National Army. During that tenure, he guided thousands of soldiers to uphold themselves during the time of stress, and also to enhance their physical strength to its peak. One Ayurvedic full body massage is included. Please book your flight to arrive at Dehradun Airport (DED) in India. Traveling by plane from Indira Gandhi International Airport (DEL) to Dehradun Airport (DED) is the safest and most convenient way of transportation and it is a one-hour journey. Most of the students choose this option and the charge is in between 50 to 60 USD. At Dehradun Airport (DED), the school driver will be waiting with a name board to pick you up and transfer you to the school. Traveling by train (from Delhi train station to Haridwar station) is also suitable and the fare is between 20 to 25 USD and it is a four to five-hour journey. At Haridwar railway station, the school driver will be waiting with your name board to receive you. Indira Gandhi International Airport (DEL) to Rishikesh by car is a six to seven-hour journey. The taxi from Indira Gandhi International Airport (DEL) to Rishikesh can also be arranged for 65 USD by Adi Yogpeeth. At Indira Gandhi International Airport (DEL), the school driver will be waiting with your name board and transfer you to the school. Airport: Indira Gandhi International Airport Airport transfer available: Indira Gandhi International Airport (US$65 per person) Additional charges may apply. You can request this in the next step.